There are few things that thrill me more than being featured on one of my long time favorite sites. Especially when that blogger goes out of her way to give Brooklyn Limestone a throughout write up. Im sure every blogger feels the same but its worth mentioning. 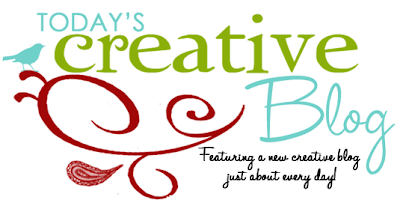 So a huge thank you to Kim of Today's Creative Blog for the spotlight. It is such an honor to be included. Hope you enjoyed the favorite nooks featured this week - giant thanks to Funky Junk Interiors, 6th Street Design School and Little House Blog for letting us in. If you have a favorite nook that is wow worthy, please send it in. congrats - and of course love your pantry, then and still love it. I loved all the nooks featured! It is so wonderful to be able to make one little area in your home perfect for you! Ahhhh, congrats!! So fantastic, Mrs. Limestone!! :) You're the best!